Jason Tan grew up in a small town called Tanjung Karang in Kuala Selangor, Malaysia. During his childhood, he was spoiled with the freshest seafood and local produce. In his teens, he moved to New Zealand to study. After graduating with a Diploma in Business, a Maori friend roped him in to start up a café. He started from the bottom; even washing dishes at one point! There, his love and passion for making good food were truly ignited. Jason returned to Malaysia in 2007 to continue chasing his passion. He spent a good 3 years at Taylor’s University, graduating with a Bachelor’s Degree in Hospitality & Tourism Management. 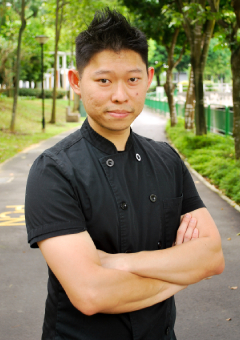 He then interned at Jones the Grocer Singapore and continued as a bar supervisor. He honed his latte art as a barista. In end 2011, Jason decided to have a complete change to pastry despite having no formal culinary training. Jason began his new adventure at dessert.cup; one of Singapore’s famed customized cake shops. Through his seven years of cake making, he went from being a commis to leading a team of cake decorators. His fondant and buttercream cake decorating skills are almost entirely self-taught. Jason truly understands the hard work and time needed to master cake decorating; something he still learns more every day. He has made cakes for all kinds of celebrations. His beautiful cake creations were often featured in HerWorld Brides publications locally. Aside from work, Jason is also an avid home cook who enjoys cooking and baking for his family and friends.